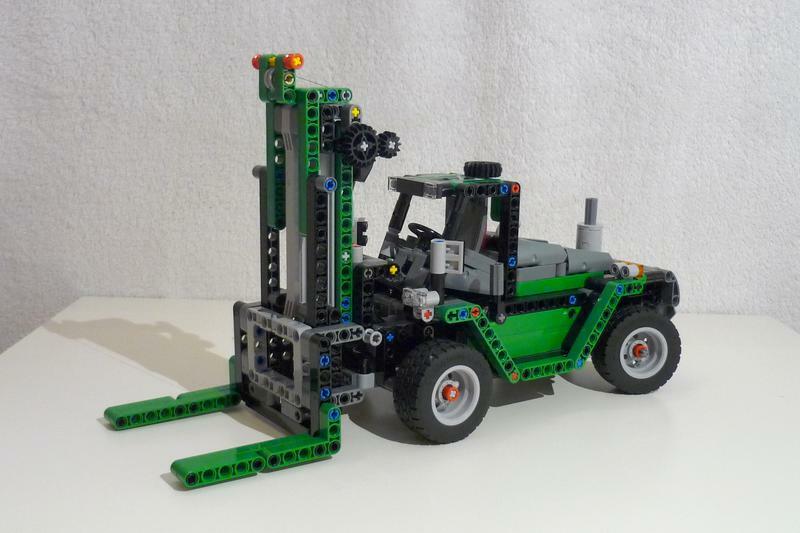 This is a modified version of 42079 Heavy Duty Forklift, built as an alternate of 42078 Mack Anthem. - Because I couldn't use a worm gear the mechanism to lift the fork includes more gears. - Then with no worm gear the fork would lower itself by weight, so I included a seemingly useless gear inside the body which brings friction to the transmission. - The engine is a four cylinder Mack style engine. And it's mounted lower than in the original forklift. - Because of missing flexible axles I came up with a solution for a door. - The rear mudguards are shorter because there weren't enough 1x4 half beams. So I made the whole wheelbase 1 stud shorter, which also helped to make the smaller wheels look less lost. - There is a transmission with two 8 tooth gears inside the body of the original which could not be replicated with the parts, so I redesigned the internal structure completely. - The fork is mounted differently because I was missing angled beams in the right length. So I used a construction with angled connectors instead. - And some more changes. A string is not part of 42078's inventory and has to be added.